Little Milton's Last Live Concert Performance was fortuitously filmed and recorded during his last concert held at the North Atlantic Blues Festival in Rockland Maine. 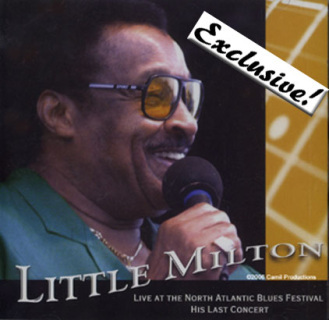 When Paul E. Benjamin, President of North Atlantic Blues Records, documented Little Milton's performance, he had no idea it would be the legend's last. The DVD is available for sale exclusively via the North Atlantic Blues Records website. For International orders, please add $15.00 for shipping and handling. Check back frequently for more exclusive items yet to be added to the store!